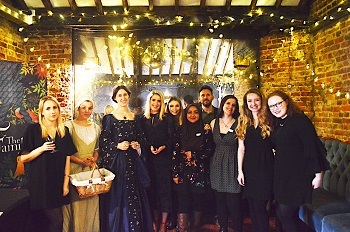 The event, held on Tuesday evening at Dead Dolls House, saw around fifty bloggers, instagrammers and vloggers, plus author Stacey Halls and the publisher team joining together to greet the book. According to Bonnier, The Familiars is 'upmarket reading-group fiction with a feminist slant, set around the Pendle witch trials in 1612. The novel is a completely immersive and beautifully written tale focussing on two women whose fates become entwined with those on trial. The Familiars is out in hardback, eBook and audio on 7 February. Halls was media editor at The Bookseller and books editor at Stylist.co.uk, and has also worked as a journalist for Psychologies, The Independent and Fabulous magazine. The Familiars is her first novel.